Balances the process of emotional release and healing and regulates detoxification of emotions to comfortable levels. Heals emotional and physical pain and lightens suffering. Fosters emotional balance and inner peace. Aids in physical detoxification and helps the liver, kidneys, bladder, gall bladder and stomach assimilate toxins and remove them. Peridot has a Rhombic crystal system and is in the mineral class of Island Silicates. It is formed in deep rock out of ultra-alkaline magma. It is most often ripped away and brought to the surface by the rising magma during volcanic eruptions. Peridot can be almost colorless, green, olive green and as a yellow-green in its coloring. 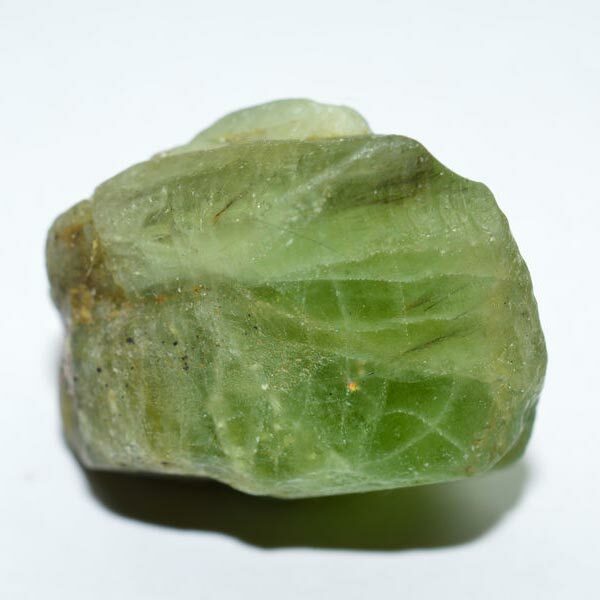 The yellow-green found in the Hawaiian Islands is many times referred to as "Chrysolite". The deeper olive green types found in Europe are generally called "Olivine". Peridot is most effective when in contact with the skin or laid over the area of the liver. It is also beneficial to lay over an insect bite to help release the toxin and neutralize it. Peridot helps us to detach ourselves from outward influences. It assists us to live our own lives and to harvest the wisdom from the abundance of experience. It helps to connect us to our destinies and to an understanding of our purpose. Peridot is in tune with the higher elements, the natural progression of events and aids in the attainment of spiritual truth. However, if you are confused or fearful, it is best to use Peridot in a limited way until those issues are resolved. Peridot can help dissolve oppressive feelings that can arise from self-blame or a bad conscience. It also helps release stored up anger and fury. Peridot helps to bring about admission of our mistakes and to then forgive ourselves. It will bring awareness to things we have neglected to do and will stimulate us to make up for the damage caused by that neglect. Peridot is a strong detoxifier and provides good stimulation of the liver and gallbladder to help metabolize and neutralize the toxins in our bodies. Peridot is ruled by the Earth and is traditionally beneficial to those born in August. It is also has special affinities for Libra and Capricorn but benefits all signs. Peridot was being used in jewelry by the ancient Egyptians several thousand years before the birth of Christ. Ancient writings referred to it as Topaz and some believe that the Topaz in the breast plate of a high priest mentioned in the Old Testament might actually have been Peridot. Ancient writings speak of cups and vessels made from Peridot that were used to administer medicinal liquids. It was believed that when used in this fashion, the healing effects of those medicines were much more beneficial and effective. Other uses dating back to Roman times were to promote better sleep if worn to bed and being worn as a ring to relieve depression.